Usually, one goes to college to learn a productive skill. A recently reported “fraud school” in China, however, fills a lucrative niche by teaching small companies how to fabricate their financial statements so they can enter U.S. capital markets and harvest millions of dollars from unsuspecting investors. The school was featured in a Chinese newspaper article in early April. The piece, titled “Unmasking the Disaster of ‘China Concept’ Stocks,” refers to an unnamed fraud school that it says is under investigation by Chinese police. The author is listed as John Caines, whose affiliations are not stated. The newspaper that printed the article, Fortune Today, did not respond to an email enquiring about Caines’ identity. The “fraud school,” which is actually an investment bank, counsels Chinese enterprises that want to make quick money on how to game the stock market in the United States, the article says. The elaborate system of fraud includes faking sales contracts, fabricating government filings, and massaging financial statements. These documents are then given an imprimatur of credibility with the help of a cooperative auditor. At this stage the company is still private, in China. Trash is turned to gold when financial statements show “fast-growing and huge-profit-making super stars,” attracting foreign investors. Private funding is then obtained, with the final step being listing in the United States. This is usually done through a “reverse merger,” where the Chinese company merges into the shell of a defunct American company that still has a stock ticker. The company is listed as an “over the counter” stock, whose regulatory requirements for selling stock are not very strict. Fake financials–provided to the company by the fraud school–keep up the picture that the company is growing. The fraud school gives detailed instructions on how to plausibly make up the revenue, profits, and cash balance. They might even go so far as to give fake lists of customers and phone numbers to investors, so they can “verify” that the company is actually doing business. This is all prepared in advance, the article says. As the company attempts to list on a reputable exchange market like NASDAQ or the New York Stock Exchange, they have to find more reputable auditors and perpetrate more sophisticated fakery. A company might hire temporary workers, inventory, and trucks specifically to show investors or auditors at inspection time, for example. When the inspectors leave, everyone goes home. Companies engaged in these practices in China are often able to go so far because they can buy the cooperation of local officials. Seals from government offices showing land transactions that never took place, or a bank account balance showing funds that were never there, are some of the schemes that have been uncovered by researchers. 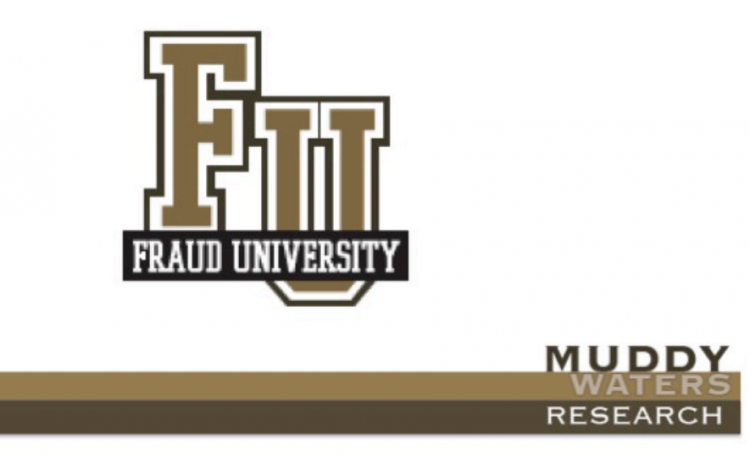 The article about the fraud school was publicized by Muddy Waters Research LLC, a research firm that specializes in exposing what it describes as fraudulent companies. The group stands to profit–through a practice called short selling–when the stock price of the company declines after Muddy Waters’ research is published. Muddy Waters attempted to identify the fraud school in question, suggesting that it was the Hong Kong-based Chief Capital LTD, whose website notes at least one company that it helped to bring to the United States that was later identified by short sellers as a fraud. Chief Capital did not answer telephone calls seeking comment. Investors’ appetites for Chinese companies that have entered the United States through the reverse merger process declined in 2010 and 2011, after a series of high-profile companies were exposed to be fraudulent.